Xerxes Moves West was supposed to turn into a "campaign without maps" but for some reason or other that didn't happen. 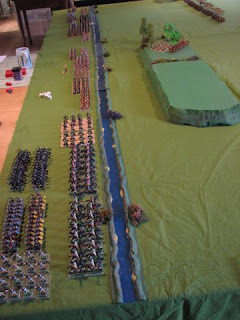 Instead I turned to the next part of another long discussed project "Great Wargames of History Refought". Having already done Marathon (based on the scenario in Grant's Ancient Battles for Wargamers) and The Korepsis Pass (From the same author's Wargame Tactics) we moved on to Plataea, which features in Grant's The Ancient Wargame. 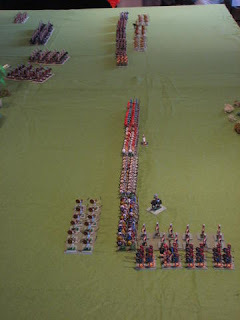 I tweaked his scenario slightly and bumped up the numbers of troops on both sides. I'm sure that all ancient wargamers have their favourite writers, I should say here that I have a particular fondness for Peter Green, whose book The Year of Salamis (1970. Reissued - as The Greco-Persian Wars - by University of California Press in 1998) I also used in compiling the scenario. Despite the troubles King Xerxes’ army suffered at the Battle of Thermopylae (480BC) and the defeat of his navy at Salamis in the same year, Persian forces were still able to occupy Athens. However, in the autumn, fearful that his lines of communication with his Empire were fatally stretched, Xerxes withdrew half his army East across the Hellespont leaving the other half under his brother-in-law Mardonius to hold Northern Greece, an area that had traditionally been sympathetic to the invaders. In the spring of 479BC after much debate the unoccupied Greek states resolved to attack Mardonius at his base near the city of Plataea on the border of Attica and Boetia. The army that set forth northwards was made up of contingents from 31 cities including Sparta, Athens and Corinth, around 39,000 strong it was lead by the Spartan Pausanias. Finding that Mardonius had established a winter camp on the northern bank of the Asopus River the Greeks marched through the pass at Mount Cithaeron and attempted to provoke the Persians into an attack by established themselves on a ridge on the southern side of the river. 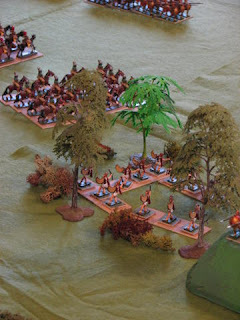 The Persian army numbered about 50,000 men of which a fifth were mounted. It included strong a strong contingent of Theban hoplites. The ridge on which the Greeks were located was too rough for a cavalry attack and so with Mardonius well supplied in his camp a stand-off developed that went on for eleven days. Eventually, after Persian horseman had destroyed a supply train and succeeding in poisoning the only water supply accessible to the Greeks, Pausanias decided to return to the city of Plataea. A staged night withdrawal was planned with each contingent leaving in turn. Unfortunately due to the traditional arguments that accompanied any joint venture by the Greek states, the retreat was chaotic. When morning came, the Spartan force was split, a phalanx under Amompharates still on the ridge and the rest (including their Tegean allies) on the plain in front of the village of Hysiae. The Athenians, meanwhile were near the Vergutiani Spring to the west of the Spartans and separated from them by about a kilometre of open, flat country. The remainder of the Greek army had arrived at Plataea – six kilometres from the Spartan position - in darkness and set up camp. They arrived late in the battle, piecemeal and apparently in some disorder. 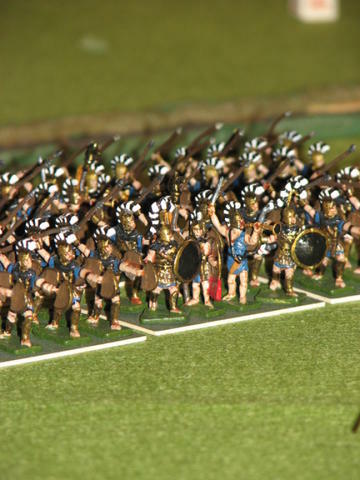 Mardonius, meanwhile, seeing his opponents on open ground at last ordered an immediate attack…..
All hoplites are in units of 24. Spartans are elite. All light troops are in units of 12. 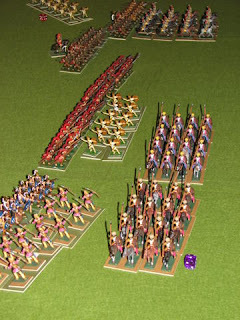 Total 288 hoplites, 72 light troops. Hoplite units from Megara, Phliasia and Corinth will appear on the North East table edge on the throw of 18,19 or 20 on a D20 (per unit). Throw at the start of each Greek turn after move one. On a positive score they appear but do not move until the following turn. “Medized” Greek hoplites are of lower quality than Athenian and Spartan hoplites. my 2 refights 2 years ago. I'm looking forward to reading about your battle played. Thanks, Ross. I really enjoyed your accounts and the interesting questions you pose about the actions of the Persians in the Grant re-fight. It raises issues about command and control which hopefully I will follow up at some point soon. And nearly twice the number I intend to using Grant's figures. Purely as a matter of interest Harry, how many figures do you have? Erm, that kind of varies between "too bloody many" and "not quite enough" depending on who you talk to. 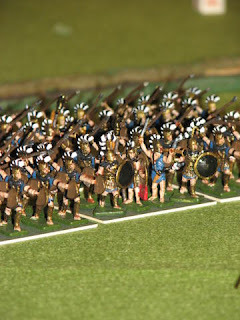 I just counted my hoplites and there are 22 x 24-figure phalanxes. This battle report is off to a great start. I share your fondness for Peter Green. "From Alexander to Actium" was a long slog but very rewarding. I'll have to check out his Persian Wars book.